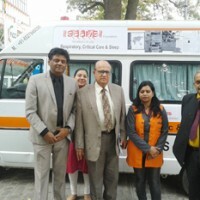 SAKSHAM – A Multi-purpose Health Worker Course for Hospitals, Home Care and Disasters. 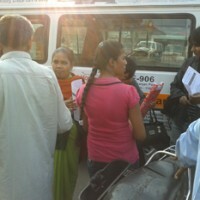 Healthcare is one of India’s largest sectors, in terms of revenue and employment, and the sector is expanding rapidly. Today the total value of the sector is about 70,000 crores which is roughly 6% of our GDP. Disaster Management is another field which has a huge potential for growth in India given the frequency of natural and manmade disasters which afflict our country from time to time. Both these sectors would require trained health care workers which unfortunately is hard to find in India. Trained health care workers like ward attendants can be more productive in both these fields if provided with a focused training programme as outlined below. This thought led to the creation of “SAKSHAM”, aSAANS foundation Initiative, which is a multipurposecapacity building forum to provide health worker and home attendant courses. SAKSHAM aspires to train suitable youth from the lower economic strata of society as multi-purpose health care workers in the health and disaster management industry. SAANS is a foundation for respiratory, lifestyle and sleep disorders, actively involved in advocacy, research and training programmes, which has received accolades from various national and international bodies. The National Heart Institute is the Research & Referral tertiary care Heart Hospital of the All India Heart Foundation, which acts as a nucleus for diagnosis and treatment of heart ailments and allied diseases is supporting the initiative. A multi-purpose Health Worker Course for Hospitals, Intensive Care, Clinics, Corporate Clinics, Pharmaceuticals and Disasters. On-job training to health workers in various establishments. Hospitals, nursing homes, clinics and home care. Rural Health Care and Sanitation. Technology skills (mobiles, walkies-talkie, computer etc.). Course content covers 48 hours of classroom lectures and 100 hours of hands on training and is based on the requirement s of the health worker in health care and disaster setting. The right attitude with skill development and knowledge of the human anatomy are provided through class room lectures, table top experience-simulations, mock drills, bed side experience, hands on experience on management of patients, bathing, bed making, feeding, bed sore care, oral drug administration, and observational experience of intravenous drug administration, device like cardiac monitors, ventilator, dialysis machine, angiography and endoscopic techniques. 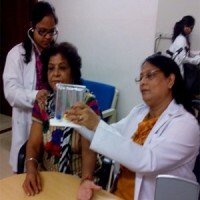 Hands on experience on BP monitoring, Temperature, Intake output,ECG, Ryle’s tube feeding, bandage and dressing, blood sugar testing, insulin administration, CPR,Respiratory care like Oxygenation, Neutralization,Inhalers, devices, noninvasive ventilators and transport of sick patients are provided. This course covers 21 hours of classroom lectures and 20 hours of hands on training and is based on the requirements of home care worker. The right attitude, bed side mannerism, communication skills and hands on experience on vital signs, personal hygiene, bed sore care, feeding, oral drug administration, mobilization, checking blood sugar, insulin injection , basic respiratory care, basic physiotherapy and Basic life Support skills are provided. Our two batches are ready and majority of health workers are suitably placed in Hospitals, Pharmaceuticals, Home care organization and many are actively involved in teaching new students. This is an appeal to your esteemed organization to consider supporting this initiative in whichever way possible. Please help us in sustainability, and scalability of this need of our concept of employability in Health Care and disaster setting. Details could be discussed at your convenience. We are releasing our newsletter”” SAANS”‘ for public awareness on health. This will be a monthly newsletter catering to community and corporates. Kindly support the cause. The tariff detail are enclosed. We look forward to a long term mutually beneficial relationship.